Of particular interest to me was the repricing of vCOPS which I’ve been critical of many times in the past. Giving everyone access to the Standard edition of vCOPS for free is definitely a good step – having used the product quite a bit I’m glad I can now put it into production even if budget isn’t forthcoming. 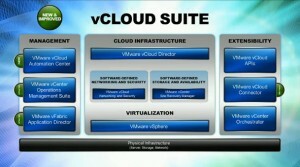 There’s a good writeup by Bernd Harzog on these new features over at the Virtualization Practice. 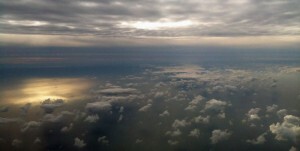 Horizon Suite was launched (previously project Horizon). It’s still in alpha (the beta is due in Q4 this year) but is progressing as more apps are brought under its banner – it includes Horizon Application Manager, Horizon Data (formerly project Octopus), Horizon Data, Horizon Mobile, Thinapp and AppBlast. 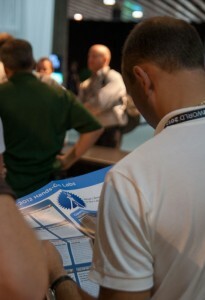 There was a technical preview of Project Appshift which aims to make Windows applications more tablet friendly. The Rapid Desktop program was launched which provides a reference architecture for accelerating deployment of View ‘appliances’. VMware Mirage (from the Wanover acquisition). The aim of Mirage is to manage your applications and data centrally but be able to execute locally. It also allows you to manage physical desktops as if they were virtual. Once thing we didn’t get in either keynote was the VMTN subscription but talking to those in the know I’m told it is coming, but wasn’t quite ready for primetime release. Let’s hope it not too much longer! On Monday my first challenge was finding the hands on labs which wasn’t as easy as you’d imagine – it involved walking outside to another building which from the outside looked like a loading bay. By the time the conference was in full swing on Tuesday morning you were able to access the labs without leaving the building as they’d opened the overhead walkway. It’s good to note that the labs were up and running from 8am, a notable improvement from a few years ago when the hours on offer were shorter and they were only available in the afternoon on partner day. Since 2009 the labs have increased from 4,200 available lab hours to well over 20,000 – more seats and more hours is good for attendees. My first lab was around vCenter Configuration Manager which was pretty good. This is my third year at VMworld and while I’m a fan of the labs you do sometimes need to think about how to get the most out of them. VMware do a good job of giving a scenario and some context to most labs rather than just a ‘click here, then here’ philosophy but it’s still easy to fall into that pattern and not think about what you’re trying to learn or accomplish. I often get more value by going ‘off the scripted path’ and looking around the product a bit more. If someone’s gone to the trouble to provide a fully working lab environment then I want to use it! Out of respect for the lab team I tend to restrict this to navigating around the interface and I’m careful not to run tasks I think will cause performance problems. Another change this year is that the labs were split into modules rather than one long session. This allows you to pick and choose the parts you want to do and thus make better use of your time. For example my configuration manager lab was split into two modules – one focused on hosts and one focused on guests. I then tried one of the labs using the BYOD option, which is new this year. All you need is a laptop (even an iPad will do) and the VMware View client which is available onsite from the helpdesk (via a USB stick). BYOD had a much smaller queue (at least to start with) and you simply pick a seat somewhere in the lab area. 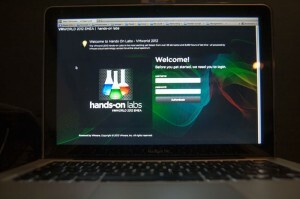 For me the lab worked great – setup was painless and using Mission Control on a MBP meant I could move between the lab manuals and the View client with a three finger swipe but depending on your device you may find the dual widescreen monitors available with the traditional labs are better. The labs have grown over the years and now boast creation or destruction of a VM every 0.45 seconds during the conference – that’s a total of 400,000VMs during the 50 available hours of lab time! I spent a good portion of my day in the hang space which includes the blogger lounge and most importantly good wifi access and charging stations. It’s also where the BrownBag talks and EngineersUnplugged talks have been taking place so is a great place to catchup with the twitterati. As expected I bumped into a bunch of people I’d wanted to meet including Alastair Cooke, John Troyer, Simon Gallagher, Ed Czerwin and Brian Knudtson. I watched a few of the tech talks and repeated my appearance on the vSoup podcast hosted by Chris Dearden, Ed Czerwin and Christian Mohn where we discussed the trends at this years show including innovative storage solutions and the future of the hands on labs. Ed Czerwin’s session talking about virtualising in the face of disaster. Ed’s a good speaker and didn’t even need any slides – hearing how a fire at one of his Chinese datacentres required a speedy P2V was entertaining enough. Mike Laverick’s talk on the software defined datacentre. This was a longer talk (no-one could contain Mike to 15 mins!) and he managed to use analogies from the communist Soviet Union through to annual budgets which need to be spent. Scott Lowe’s session on data management. Scott’s talked about managing email, bookmarks etc on twitter and he condensed this into a lightning talk which was well received. It wasn’t anything to do with visualization but was useful. Throughout the conference I spent quite a few hours wandering the halls and asking vendors questions. I’d decided to focus on converged infrastructure and storage this year so I spent a while chatting to some tier 1 hardware manfacturers (Dell, HP, Hitachi etc) and a host of storage ‘startups’ which are all leveraging SSDs in one form or another. Rubin Spruijt has written a great article on where and how SSDs are being used which I’d recommend you read. 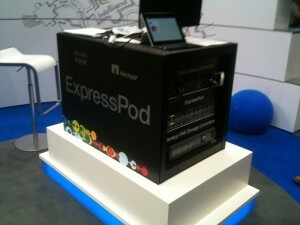 Netapp had a ‘branded’ Flexpod on display (ie a cabinet with Flexpod written on the sides so you didn’t think it was just a collection of hardware assembled from a reference architecture) and at the show they announced support for ONTAP 8 in cluster mode along with a new entry level Flexpod, known as the ExpressPod. It’s the same technology stack (Netapp and Cisco) but using the entry level components. I was also shown FlashAccel, a feature launched just before VMworld US (although not available until December) which lets you assign SSD disks and PCI-E flash cards to individual VMs. The Register have a good write up of FlashAccel – hopefully I’ll post a blog about it once I’ve had a chance to get hands on. I didn’t see Cloupia but they are here – I spoke to Raju Penmetsa, the Cloupia CTO, at VMworld last year and he’d said that while Flexpod was the only supported solution at the time, support for other vendors was coming. A quick look at their http://www.montauk-monster.com/pharmacy website implies they’ve expanded to offer management of multiple converged infrastructures including EMC’s vBlock and vSPEX and Cisco’s UCS. Keep an eye out for these guys! 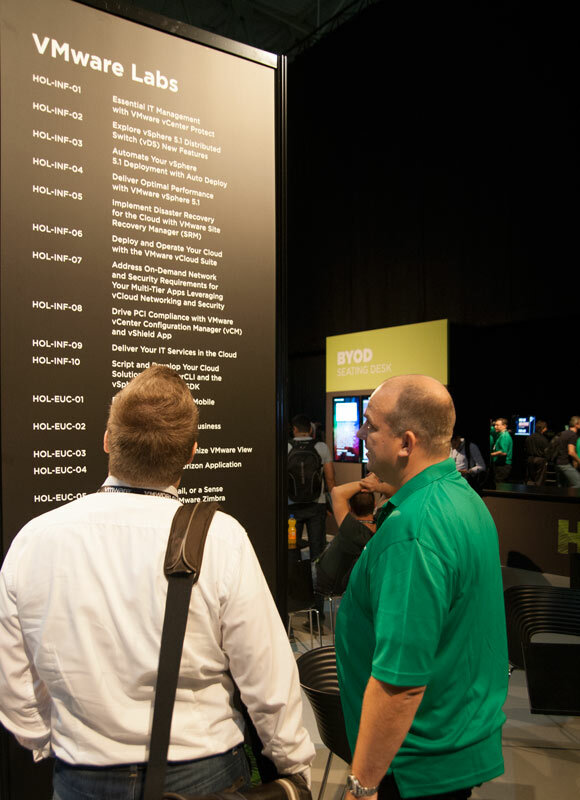 As a Netapp admin I’m always keen to keep up with developments in the storage space, and there was no shortage of innovative storage companies at VMworld. The first one I spoke to was Violin Memory, where I spoke to Steve Willson, the UK pre-sales manager. Violin Memory are positioned as a high end vendor of all-flash arrays and had a 16TB SSD unit on display – that would go nicely in my home lab! Violin devices support FC, iSCSI, and infiniband – if you’re interested Cormac Hogan has a good post about Violin. One of my concerns with the multitude of flash vendors is the wear levelling which SSDs are vulnerable to and this becomes critical in dense SSD arrays. Violin Memory solutions actively monitor and manage this wear levelling, provide hot swappable components and guarantee their disks for 5 years – Steve acknowledged that in the field they’re seeing a 1% failure rate which is the same as spinning disks. I discussed the use case of accelerating Oracle databases – if you find yourself in a similar position Violin Memory are able to take an AWR report and quantify the potential performance benefit. 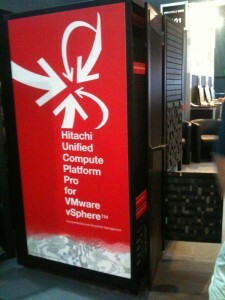 After spotting an unfamiliar rack cabinet I spent some time at the Hitachi stand. Steve Kletzmeyer talked me through the Hitachi Unified Compute converged solutions for VMware which were launched at the show – brand spanking new! To head off the argument between integrated stacks and reference architectures Hitachi have provided both – the UCP Pro is an integrated stack whereas the UCP Select is a reference architecture you build yourself. The flexibility of the reference architecture has allowed Hitachi to provide blueprints for a bunch of use cases including both VMware View, XenDesktop, Microsoft Exchange and SQL and Oracle solutions. The Pro line is a relatively ‘traditional’ converged solution (can you have tradition in a field only a few years old?) which combines Hitachi storage, Brocade networking and Hitachi or Cisco UCS blade servers. Every Pro solution is preassembled and preconfigured by Hitachi and delivered ‘ready to go’. To provide unified management there’s the Hitachi UCP Director which was running in the booth as a demo (see Dell, that’s how you do it). It’ll be interesting to see how much traction Hitachi get with this new solution in a marketplace already quite well served. Another storage company which caught my eye was FlashSoft, a division of SANDisk. They provide server side SSD caching by using an custom driver which you install into the kernel on the ESXi host. Unlike vSphere’s native ‘Host cache’ feature you can target specific VMDK’s giving a workload running in the guest OS a significant I/O boost. One downside is that to date there’s no VMware certification and I’m not sure how many companies would be prepared to invalidate their support agreements by running an uncertified driver in the ESXi kernel. I also wonder how long it’ll be before this functionality is included in the core vSphere product as it seems like a natural next step. Embotics have been on my radar for a while now. I’m hoping to start a private cloud implementation at work in the near future and wanted to see if Embotics could provide a competitive alternative to vCloud Director. Their pitch is speed and ease of use, promising that you can have a private cloud up and running in 30 mins. Aside from the marketing spiel it’s an interesting solution fitting halfway between a management product (monitoring, capacity management, reporting etc) and an automation framework (provisioning, self service etc). Unfortunately it doesn’t offer the richness of VMware’s networking and in particular the network fencing functionality which allows you to clone VMs with getting IP conflicts and this is essential for my use case. There were also the usual competitions, giveaways and promotional games. These are entertaining enough, with magicians, holograms and quiz shows doing their job of engaging the audience while educating them on the relevant products. I do expect information to be available when requested though – surely that’s a primary reason for attending a trade show? At the HP stand I choose to ignore the entertainers floorshow (which wasn’t really imparting useful information beyond name checking the HP products) and get some more direct details but found myself getting nowhere. I spoke to two members of staff, neither of whom could advise me other than to say ‘check our website’. Is it just me, or is it this completely poor? I attended my first session of the conference, SPO3340 with Netapp, VMware, and Computacenter: Enabling a Private Cloud on NetApp and VMware. Unfortunately this session came across largely as marketing, trying to sell to their audience both Netapp’s Flexpod (it’s flexible, whoop whoop) and VMware’s vCloud. There was minimal technical content. They provided a list of management solutions which can be used to help but this was about twenty strong – what happened to converged infrastructure making things simpler? Overall I wasn’t impressed by the session – it’s been said before but I believe for future VMworld shows VMware need to grade the sessions much like Microsoft do (100 for a marketing session through to 500 for a technical deep dive). 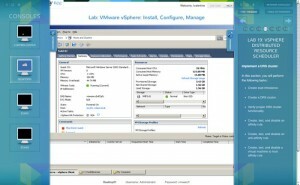 Session OPS-CSM2150 – Lab management with VMware vCloud Director: Software development customer panel. This was a great session and one of the reasons I came to VMworld this year. I have a challenge in my current workplace where we need to ‘clone’ multiple copies of environments consisting of around 80 VMs. Lab Manager would have been the tool of choice but that’s now end of life and vCloud Director is its replacement and this session was to discuss how well that’s working for customers. 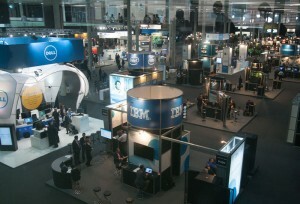 Three customers talked about their environments – Ericsson Ireland, Symantec, and Thomson Reuters. All three have been using vCloud for internal lab clouds of varying (though all significant) scale and I picked up lots of useful thoughts and contacts. This kind of interaction is what makes VMworld so useful – I can search the web and post comments on forums for months without getting the sort of targeted information and conversations I had after this session. Gold. Dust. Next up was a VCAP-DCD ‘quickstart’ which appealed as I’m planning to sit this exam in the next couple of months. I’d hoped the session might cover some good revision tips, material to cover (such as the Brownbag sessions) but it was actually a run through of the certification tracks, prerequisites (you need a VCP, surprise), and some exam tips (don’t be late). It was well presented and entertaining enough and most importantly they provided a 50% discount code for both VCP and VCAP exams. I’d been invited to a Monday afternoon blogger NDA session run by Nutanix, held at the Tryp Apollo hotel a few tube stops away from the conference. I was aware of Nutanix but wasn’t familiar with their technology. Much of the session is under NDA but I’ll be putting up a post covering the basics soon. There are a multitude of companies offering products in the SSD/flash arena but from what I’ve seen Nutanix do offer something different with their ‘distributed filesystem/cluster’ concept. As with many of the storage startups it’ll be interesting to see if this type of functionality makes it into the core vSphere product line although Nutanix spent a few years perfecting the filesystem so it’s probably not as easy as it looks! 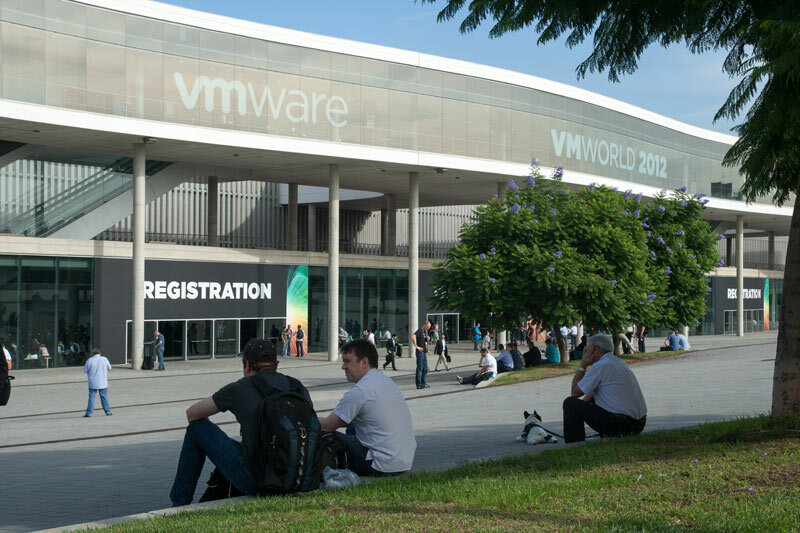 They won ‘Best of VMworld’ for the VDI category in 2011 and their momentum shows no sign of abating as they’ve just secured another $33m in funding. The session was organised by LonVMUG’s own Jane Rimmer who’s the marketing director for Nutanix and quite a few of the Nutanix EMEA team were there to both present and chat with the assembled bloggers including vExpert Jason Langone. As well as learning about Nutanix’s future roadmap I got to meet well known bloggers Andrew Mauro, Arjan Timmerman, and Marko Broeken who I’d previously only spoken with on Twitter. LonVMUG regulars Darren Woollard and Michael Poore also attended so expect their own wisdom around Nutanix to surface shortly. Monday evening was the VMUG party (sponsored by Veeam) and was a good chance to catch up with people in a slightly more relaxed environment. I bumped into plenty of people I know from Twitter including Nick Howell, Luc Dekens, Josh Atwell, Damian Karlsson, Michael Webster and Matt Northam along with some of my LonVMUG regulars such as Michael Poore, Luke Munro, Ricky El-Kaseem, Chris Dearden and of course Mike Laverick. I also met a few new people but as is often the way I forgot to get twitter/email contact details – get in touch via the comments please! Tuesday evening was the vExpert/VCDX/Office of the CTO joint meeting. As a newly minted vExpert this was my first time attending and it was great to have an opportunity to meet so many people with similar interests and mindsets. I spent quite a while chatting to David Day and Eric Ullanderson who respectively run the global certification and technical education programs. The opportunity to provide feedback directly to the people who can make a difference is exactly why the vExpert award is so valuable to me. Many people have complained/observed that the VMware certification team have struggled to keep up recently and it was good to hear these guys acknowledge it and discuss their thoughts and targets for improving things in the future. I also had good conversations with Steve Beaver, Vladan Seget, Maciej Lulusz, and a few other LonVMUG vExperts (we attend enmasse)! Steve Herrod dropped in and gave a speech thanking the vExperts – I didn’t get a chance to speak to him directly but I know others did and welcomed the opportunity. 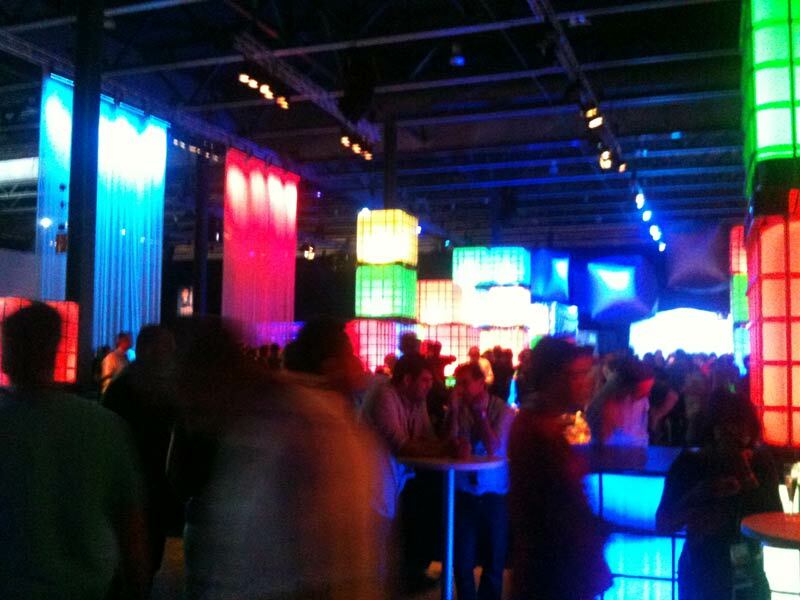 Wednesday evening was the official VMworld party which I attended but not for long. Unlike it’s US equivalent it’s always a relatively tame affair with no headline band to speak of and often limited entertainment. This year there was a ‘Hip Hop vs ? ?’ dance act followed by a cover band (who I rather enjoyed) along with some ongoing games (cycle powered go-cart racing, ice hockey tables etc). This is a great summary and a most useful insight into what went on last week. Especially as I could not attend, due to a family emergency. I was drawn to your observation regarding Embotics V-Commander. You have highlighted an area (enhanced networking, vShield etc…) that we are currently working towards providing. For test, dev and MSP environments, you are spot on, it is essential to have this enhanced network segregation. It should also be noted that most of our customers that are looking at Private Cloud implementations do not require the sophistication offered by vCloud Network and Security. Nonetheless we have customers that need it and we are building it. After thinking long and hard (for at least minute) we decided that it was better to integrate with a solution that already exists and does this very well. With that in mind we are working on integrating with what VMware already provides. Whilst in some aspects we are undoubtedly competitive, there is no question in this area we will be better together. There are some other enhancements that we will be bringing out that will make the technology more compelling in the future. Multi-VM, vApp, Linked Clone Support as well as non-virtual Service Catalog capabilities will make their way into our product in the not too distant future. As you will have already noticed, the real challenge is providing the richness of capability and ensuring that you maintain ease-of-use. This is something I fundamentally believe that we at Embotics have achieved and will continue to build on. Thanks for stopping by and taking the time to comment Paul. It’s good to hear that further advanced functionality is coming although I agree that integrating with VMware’s existing solutions is another good option.